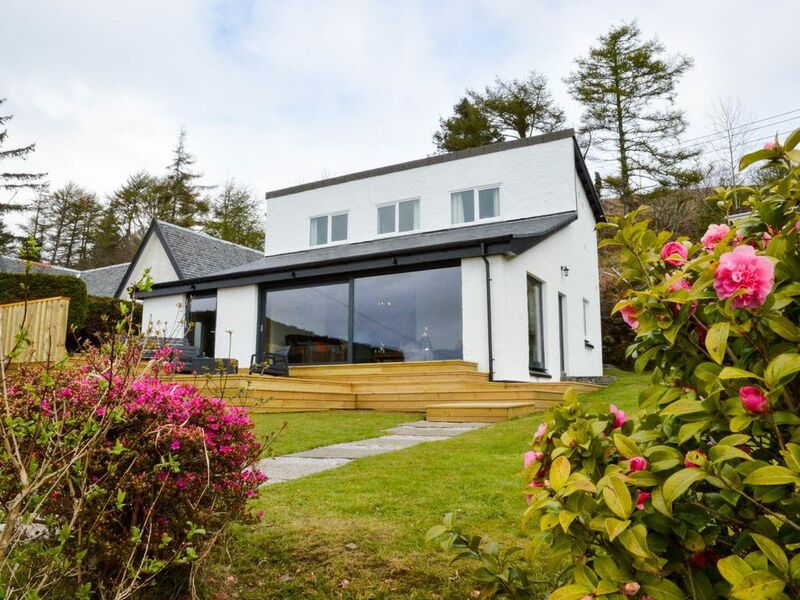 Arduaine 28 km from Oban: Cosy, luxurious cottage "Arduaine", renovated in 2017. In a secluded, sunny position, 200 m from the sea. Private: garden. Garden furniture, parking. Shop 4 km, grocery 6 km, supermarket 7 km, restaurant, bar 500 m, railway station "Oban" 28 km, ferry "Oban - Isle of Mull" 28 km. Golf course (18 hole) 7 km. Nearby attractions: Arduaine Gardens 1 km, Oban Distillery 30 km, Dunollie Castle 33 km. Please note: car recommended. 6-room house on 2 levels. Comfortable and stylish furnishings: living/dining room with open-hearth fireplace, satellite TV and DVD. Mezzanine with dining table. 1 double bedroom with 1 double bed and shower/WC. 1 room with 1 double bed. Exit to the garden. 1 room with 2 beds. Exit to the garden. Open kitchen (4 hot plates, oven, dishwasher, microwave, freezer). Bath/shower/WC. Heating. Upper floor: 1 double bedroom with 1 double bed and shower/WC. Large terrace, garden. Terrace furniture, barbecue. Marvellous view of the bay. Facilities: washing machine, dryer, iron, children's high chair, baby cot for up to 3 year olds. Internet (WiFi, free). IPod docking station. Please note: non-smoking house. TV only EN.